HARARE, Jul 24 2013 (IPS) - Gibson Muzungu’s hope for a free and fair election on Jul. 31 has faded after local Zimbabwe Africa National Union-Patriotic Front party officials seized his identity card, apparently to check if he was a registered voter. “I already suspect the polls will be rigged by Zanu-PF after local Zanu-PF officials forced me to surrender my I.D, saying they wanted to check if I was a registered voter,” Muzungu told IPS. “But do I need someone to check for me when I can do that on my own?” His I.D. card is yet to be returned and he suspects that it will be used for a fraudulent vote. Muzungu, who is from Chivhu district, in Mashonaland province in eastern Zimbabwe, is amongst hundreds of villagers in his neighbourhood whose I.D. cards were allegedly seized by suspected Zanu-PF officials. He added that local traditional leaders were busy cautioning villagers against voting for one of the Movement for Democratic Change (MDC) parties to avoid post-election violence by Zanu-PF. Tawanda Chimhini, director of the Elections Resource Centre (ERC), a local independent election organisation, said they were aware of villagers being coerced to vote for specific parties. “Yes, we know there are traditional leaders in the countryside receiving orders from their political handlers to order villagers to vote for one party over another. It is unlawful and we expect the law to take its course against such individuals. The electoral code of conduct doesn’t allow that,” Chimhini told IPS. “ERC, like the ordinary electorate, is worried that this year’s elections may be rigged considering that many people could not register, and that shortages of voting material derailed the special voting for police and soldiers, which was worsened by the Zimbabwe Electoral Commission’s (ZEC) failure to publicise voting information,” said Chimhini. On Jul. 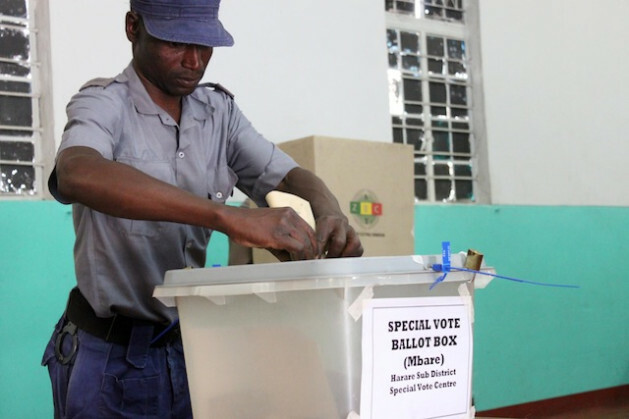 14 and 15 the ZEC held special elections for the country’s national security forces. However, the voting was disorganised and showed that the electoral body was ill-prepared for the coming elections. Polling stations opened late, and many did not have voting ink, ballot papers or even the voters’ roll. In the end only 10 percent of registered security forces voters cast their ballots. According to the ZEC, about 70,000 police officers and soldiers applied for special voting ahead of this year’s polls as they will be working on election day. However, the treasury department here says that the total number of soldiers and police on the national payroll is 48,500. The discrepancy in figures has also raised concerns among analysts that the special polls were rigged and that “ghost voters” will complete the remaining ballots. ZEC deputy chairperson Joyce Kazembe conceded that the special voting exercise had been riddled with errors. “We have taken note of the concerns and disputes reaching us and we will address them as we proceed,” Kazembe told IPS. On Jul. 21, while addressing supporters in Gweru in Zimbabwe’s Midlands Province, about 340 km west of Harare, Prime Minister Morgan Tsvangirai said he was concerned that the ZEC had printed eight million ballot papers for six million registered voters. Tsvangirai is the opposition Movement for Democratic Change – Tsvangirai (MDC – T) presidential candidate. The Research and Advocacy Unit, a local research organisation, added to Tsvangirai’s concerns saying that over two million eligible voters had not registered and more than one million deceased people were still on the voters’ roll. But Zanu-PF national spokesperson Rugare Gumbo said he saw nothing wrong in the ZEC printing extra ballot papers. “If the ZEC printed more than the required ballot papers, what’s wrong with that? Isn’t it better to have more in case of damages?” Gumbo told IPS. Civil society organisations here have also expressed their fears of a rigged election. Raymond Majongwe, secretary general for the Progressive Teachers Union in Zimbabwe, said politicians were contesting in a poll already decided. “The MDC-T didn’t listen to us when we told them to enter into this race after the implementation of electoral reforms. But they entered nevertheless, and they are contesting an already-won match,” Majongwe told IPS. Zanu-PF has reneged on implementing media and security sector reforms stipulated in this southern African nation’s Global Political Agreement (GPA). The GPA is a 2008 pact between Zanu-PF and the MDC that paved the way for the current unity government and the elections. President Robert Mugabe had declared that the elections would go ahead on Jul. 31, despite calls from the Southern African Development Community for Mugabe to first implement the reforms and to postpone the date. Local political parties, including the MDC-T had filed separate petitions with Zimbabwe’s Constitutional Court to delay the elections. The petitions were overruled by the court. South African President Jacob Zuma’s top aide and point person in Zimbabwe, Lindiwe Zulu, said on Jul. 18 that preparations for Zimbabwe’s elections were “not looking good”. Zuma later apologised to Mugabe over the comments. Claris Madhuku, director for the Platform for Youth Development, a local democracy lobby group, accused Zanu-PF of deliberately causing electoral challenges and aiming to rig this year’s elections. 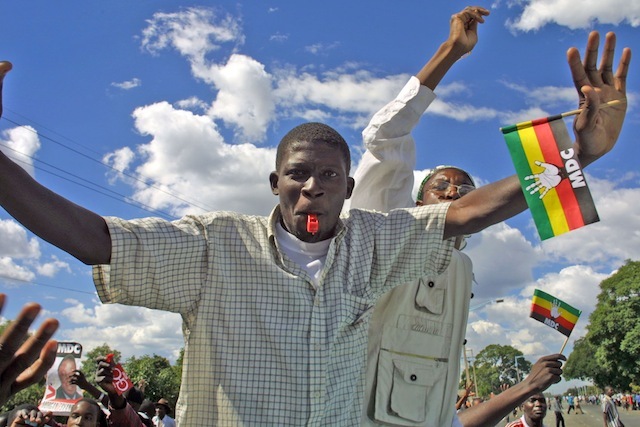 “Zanu-PF has a long history of political unfaithfulness, and there are many things on the ground raising suspicions that the polls will be rigged. Zanu-PF does so many sophisticated things to keep itself afloat that we can’t see easily, and it is surely plotting to steal this election,” Madhuku told IPS. Several political analysts have expressed fears of rigged polls. “Rigging remains the sole survival kit for the former ruling Zanu-PF. And if exposed, it will leave the party with no other method to ensure it rides to victory save to unleash violence and chaos to win the polls,” Vincent Ruhembe, an independent political analyst, told IPS. There are many like Nyson Nhemachena, a 23-year-old teacher from Harare’s Mabvuku low-income suburb, who were unable to register to vote.